Hawai‘i farmer and tropical gardening expert, Evan Ryan just launched a new resource book Hawai‘i Home Gardens: Growing Vegetables in the Subtropics Using Holistic Methods. As a Hawai’i-based farming educator and garden consultant, Ryan offers classes, workshops and lectures that inspire responsible land design and truly sustainable practices. The cover of the new book. 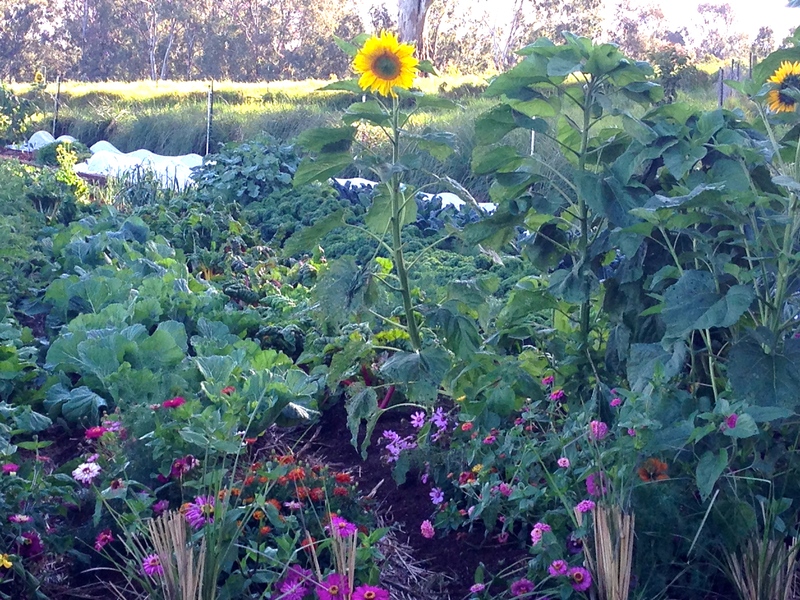 Ryan’s practical strategies lead to an abundance of locally grown food using organic, chemical-free methods. His multigenerational approach also improves local ecosystems, restores topsoil, reverses the impacts of erosion, and maximizes the use of water resources. 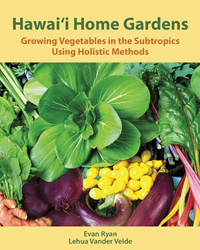 Hawai‘i farmer and tropical gardening expert, Evan Ryan just launched a new resource book Hawaii Home Gardens: Growing Vegetables in the Subtropics Using Holistic Methods. This comprehensive step-by-step guide contains the keys to a successful vegetable gardening experience. Order your copy and peek inside the book at http://www.hawaiihomegardens.com. Implementing the strategies shared in Hawai‘i Home Gardens will save you time and money while inspiring you to get out and grow. Using the book’s techniques will build confidence in home gardeners both new and experienced, as well as landscape professionals, and beginning farmers. Author, Evan Ryan has been farming in the tropics for over 20 years. His experience began in the Ecuadorian rainforest practicing agroforestry with indigenous communities and evolved through classical training in Permaculture and organic farming in Hawai‘i, South and Central America, Southern Africa and Southeast Asia. He is the director and founder of Pono Grown Farm Center (http://www.ponogrown.org), a non-profit off grid diversified production farm and mentorship center, and a founder of the Hawai‘i Seed Grower's Network which educates people on seed literacy and is launching a seed marketplace for Hawai‘i grown seeds in early 2018. Ryan is also an agricultural education teacher through the University of Hawai‘i and the Farm Apprentice Mentorship Program of the Hawai‘i Farmer's Union United. Currently a Hawai’i-based farming educator and garden consultant, Ryan offers classes, workshops and lectures that inspire responsible land design and truly sustainable practices. Founded on universal growing principles, Ryan’s practical strategies lead to an abundance of locally grown food using organic, chemical-free methods. His multigenerational approach also improves local ecosystems, restores topsoil, reverses the impacts of erosion, and maximizes the use of water resources. Hawai‘i Home Gardens has the ability to revolutionize the way food is grown throughout the tropical and subtropical regions of the world. University educators, school garden coordinators, and farmer training programs in Hawaii have already embraced this book as their text. Evan Ryan's work is transforming land care practices throughout Hawai‘i and beyond! Farmer, Author, and Educator Evan Ryan Gardens at Pono Grown Farm Center A diverse food Forest harvest at Pono Grown Farm Center.